King Felipe had a minor surgery to deal with his backpains on July 14 in Ruber Hospital in Madrid. Felipe really looks tense/stressed these days, even at fun events. Maybe it is the white beard but he has visibly aged since becoming King. The 1st day of school after the recent trip to Asturias for Leonor and Sofia. It's nice to see the family going into school with the other children and Letizia just entering as if she was a regular parent at the school, it made for a really down to earth back-to-school shoot. Sofia doesn't look too happy though, it looks like she probably didn't want to have to face the paparazzi on her first day back - I don't blame her though. I wouldn't want clicking cameras in my face early in the morning on a first day either. Spain starts quite late in September in comparison to other parts of Europe, who would've been back for almost a couple of weeks or even three weeks (if starting in late August) by now. Normally here in England it's the universities who go back at this time as I start my new semester on Sunday and the schools went back in the first week of the month. Spain starts quite late in September in comparison to other parts of Europe, who would've been back for at least a couple of weeks or even three weeks (if starting in late August) by now. Normally here in England it's the universities who go back at this time as I start my new semester on Sunday and the schools went back in the first week of the month. In Croatia schools started on September 3rd, it’s usually on first Monday in September. And it was still too hot, being up to 30 Celsius this week. I believe the hot weather and the tourist seasons are the reasons why Mediterranean countries start so late. And we also finish school by June 15th, because it would be too hot afterwards and schools don’t have air conditioning. True. In Portugal schools are about to start this week and the following week. It's always been like this, either if it's Elementary/High School or University (but University usually starts a week later than compulsory school). It's only the second week of September. And a few days off for national holidays throughout the year. So, only three holiday periods of about 14 weeks in total. Very different from for example the Dutch pattern in which summer holiday is only 6 weeks but many more in between (1 wk autumn, 2 wks christmas, 1 week 'spring' (end of February), 2wks may); a total of 12 weeks plus several additional days off. So, the total number of days/weeks off is slightly higher in Spain but the main difference is the way it is organized (although I probably should say that the Dutch are the exception with their 6-week summer break; I don't know of any other country other than the Dutch former colony I know live in that has such short summer breaks- which in terms of education is preferable over long summer breaks; edit: just found out that Denmark has 6-7 weeks of summer break and less days off throughout the year (although I would hope the students have some days off between end of February and summer... so hopefully Wikipedia is mistaken). Comparing with another European monarchy: summer break in Belgium are the months of July and August (about 9 weeks), in addition the students have 1 wk of autumn, 2 wks Christmas, 1 wk spring and 2 wks Easter breaks. The American system is a bit in-between and probably comparable to many other countries (including for example Sweden) with a long summer break like the Spanish but adding a few more shorter breaks throughout the school year. Yes, I’m aware of what time of the month it is. I mentioned “at least a couple of weeks” because some schools in Europe, such as in Denmark, go back in mid to late August since I was referring to Europe in general in that part of my post rather than “my” country which I mention in the other part of my post has been back for almost two weeks. It’s not a big issue though and I used such generalisation to refer to what time different schools started for the new academic year. Guess I should have been more specific. Coming from a colder country heat isn’t something that’s taken into consideration for us (air conditioning is expensive where I live for a reason haha) so I guess I’ve always found it strange when other countries’ schools go back later, but the hot weather in Spain does make a lot of sense for the late school starts. I’ve been to Ibiza when it was 42 degrees in the summer and there’s no way I’d expect anyone to attend school in that kind of heat! Since British weather is infamous for being unpredictable, we’ve always broken up for the summer late (often early July for private schools and mid - late July for state schools) and gone back for autumn early. I mentioned “at least a couple of weeks” because some schools in Europe, such as in Denmark, go back in mid to late August since I was referring to Europe in general in that part of the post rather than “my” country which I mention in the other half which has been back at school for almost two weeks. It’s not a big issue though and I used such generalisation to highlight the different times schools returned for the new academic year. Guess I should’ve been more specific. I'd say that probably last week was the week that the largest groups of schools in Europe started (so not necessarily the majority but the week that had most school starting compared to other weeks) but indeed, there are several countries where schools start mid to late August. My niece and nephew also started 2 weeks ago (but in the Netherlands it depends on where you live when school starts and ends). Here they are mid-way through their summer break (mid-August to end-September; restarting on October 1). 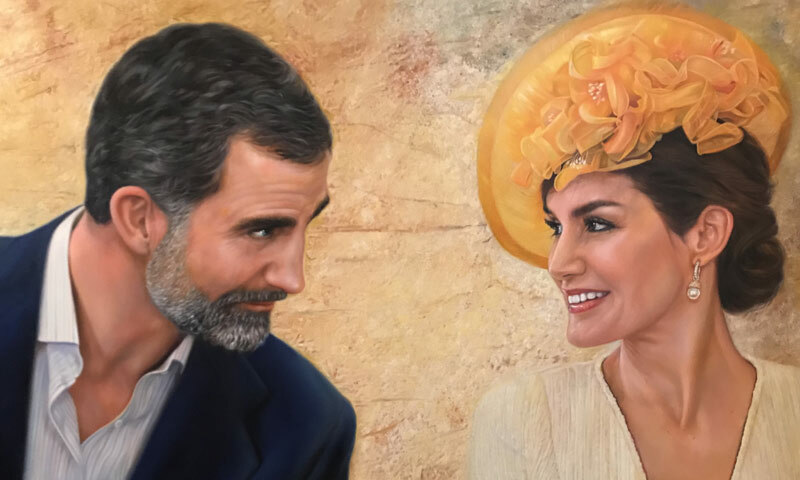 A new portrait, an unofficial for King Felipe and Queen Letiza from Marcos Garcia a retired policeman from Marbella! 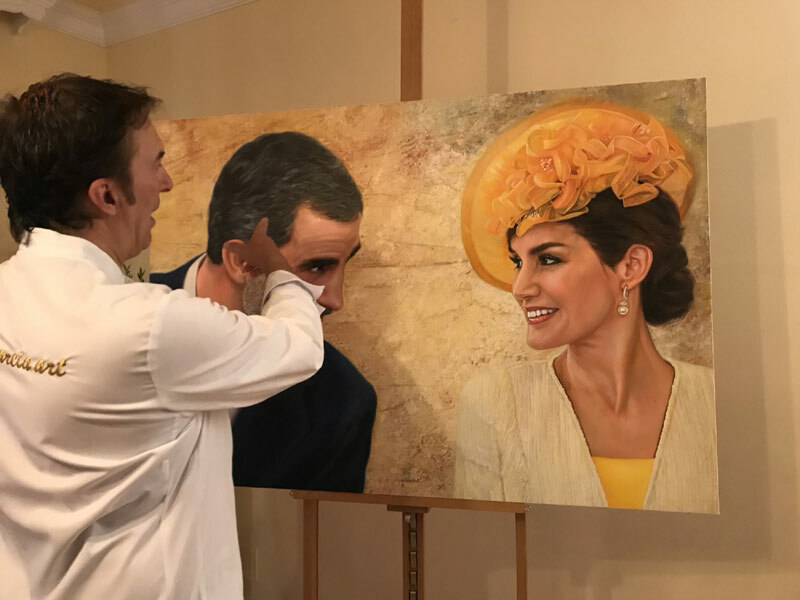 Marco Garcia has also make portraits of King Salman, Prince Muqrin brother of King Salman and King Mohammed with Princess Lalla Salma and CP Moulay Hassan. Nice birthday present for queen Letizia! Letizia yes, but Felipe is casual ... strange mix. What a wonderful talent this retired policeman has. Brilliant portrait and apparently how he would like to see them more often. King Felipe more down to earth, informal & casual and Queen Letiza more formal, stiff and strict. Interesting. 6 more coins will be issued in honor of the King's 50th birthday. They will show important steps in the life of Felipe VI, such as the swearing in of the Constitution before the Cortes Generales in 1986, when he served as standard-bearer of the Spanish Olympic team at the Barcelona 92 ​​Games, his wedding with Doña Letizia in 2004 and with the Princess of Asturias. Thanks lula. Are the cinema photos paparazzi shots? They seem quite posed to me since Leonor is looking in the direction of the camera and Felipe and Letizia also seem quite posed.